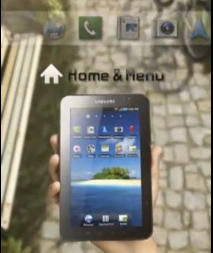 Remember the nice Galaxy Tab site that Samsung launched on September 2nd during the official Galaxy Tab unveiling? At the time, the video section of the site only included the official commercial and a very brief teaser. Now, however, Samsung posted another addition - a video walkthrough of the Tabs main features - ones you would potentially use on a daily basis. The video was completely silent and embedded in their Flash site, so I "borrowed" it (I promise, I'll give it back) and uploaded it to Youtube for your more comfortable consumption. It's also vertical due to the Tab's natural aspect ratio, so it may look kind of weird in the Youtube player - just maximize it, max out the quality (480P) and you should see everything pretty well. Oh, and I threw in some background music via Youtube's AudioSwap, albeit not very good - the interface for finding AudioSwap music is pretty horrendous for the huge amount of choices.